UW Medicine has cited budget shortfalls in deciding to close its Mount Baker laundry facility. The union representing laundry workers says the closure will harm the employees, most of whom are immigrants and people of color. The University of Washington has finalized its decision to shutter the Mount Baker laundry facility that cleans linens for UW hospitals, a move that would result in job losses for about 100 employees by March. The university has cited budget shortfalls and pledged to help workers find new jobs. The possible closure of the facility — where 94 percent of workers are people of color and 89 percent are immigrants, according to the union representing the employees — has sparked concern and protest for months. UW Medicine notified workers on November 2 that it plans to close the facility and instead contract its laundry services to Auburn-based Hospital Central Services Association (HCSA), said UW Medicine spokeswoman Tina Mankowski. UW Medicine is “within days” of finalizing its contract with HCSA and anticipates the laundry will close in March, Mankowski said Wednesday. Workers at the 30-year-old laundry, at 2901 27th Ave. S., clean linens for several UW Medicine facilities, including Harborview Medical Center. Mustafa Getahun, who said he has worked at the laundry for 21 years, was off on the Friday his co-workers were notified in person about the closure and learned of the news in a phone call. Getahun said he and other workers feel “helpless.” Worried about his lack of training for a new job, Getahun said he may seek janitorial work. Workers will be paid an extra $4 an hour for all hours worked between now and the closure but will not receive severance pay, Mankowski said. Human-resources staff are now meeting with employees about other potential jobs, Mankowski said. 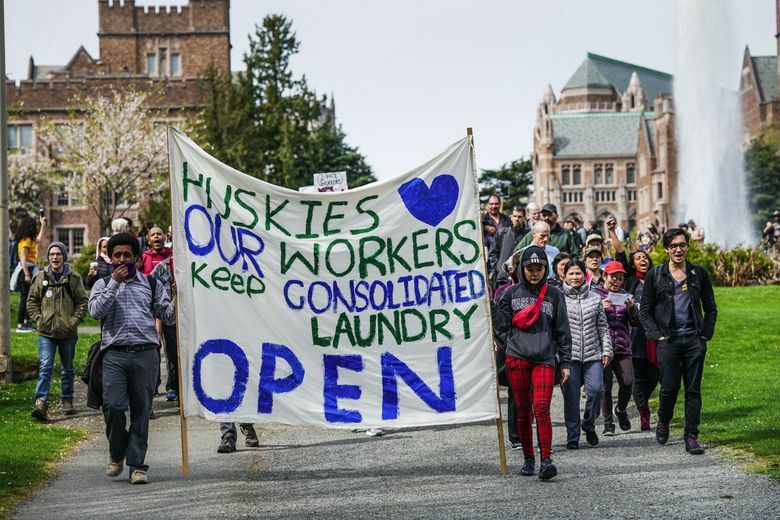 The union representing the laundry workers still worries “there’s no guarantee” workers will get new jobs, said Rod Palmquist, higher-education strategic coordinator for the Washington Federation of State Employees AFSCME Council 28. “I don’t see any basis to view these as anything but false promises.” HCSA workers are not represented by a union, Palmquist said. The laundry closure comes against the backdrop of a dismal financial picture at the university. Last year, UW Medicine faced a $75 million operating deficit. The university has more than $1 billion in deferred maintenance, and the UW School of Dentistry has a debt of $38 million, a spokesman said. The union maintains that UW Medicine should delay the closure. Last month, the union sent UW Medicine a consultant’s report to argue that upgrades to the 30-year-old laundry could lower its operating costs over time, Palmquist said. “It was very clear they did not want to work with us,” he said. Mankowski said UW Medicine considered the report but believes it underestimated the costs of necessary renovations. News of the closure also comes on the heels of the university’s Board of Regents’ negotiations with the City of Seattle over UW’s campus master plan. Among the conditions the City Council has imposed is a requirement that the university provide 450 units of affordable housing. UW has argued it should be able to provide those units not just on campus, but throughout the city near light-rail stations. The laundry facility is located next to the Mount Baker light- rail station. Sally Clark, director of regional and community relations for UW, said it has not yet been determined whether the land where the laundry currently sits would be used for affordable housing after the laundry is closed. Information from Seattle Times archives was used in this report. This story has been updated to correct the amount of deferred maintenance and debt at the UW School of Dentistry.